Thanks to Madman Entertainment, ccpopculture has 3 copies of What We Do in the Shadows’ Fang-Bloody-Tastic Collector’s Edition (Blu-Ray/DVD) to give away. 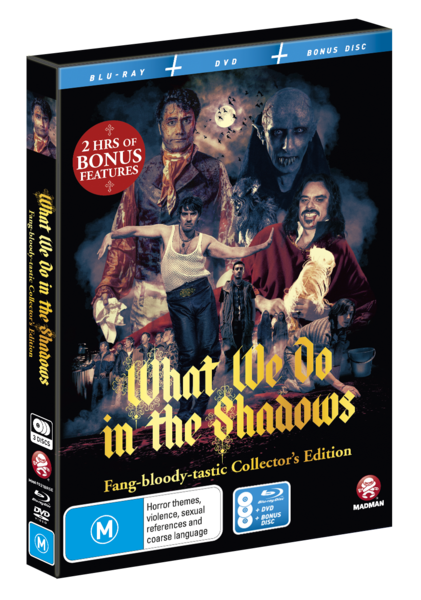 There’s a lot to recommend Madman’s Collector’s Edition release of What We Do in the Shadows: a gorgeous slipcover, a copy of the film on Blu-Ray and DVD (complete with commentary) and, most importantly, a bonus disc with over two hours of special features. Now, two hours of special features isn’t always that exciting, but I sat down last week to watch the entire contents of the bonus disc and they are, with very few exceptions, fantastic. There’s a bunch of deleted scenes, in-character interviews and – best of all – the entire short film that inspired the feature length comedy. And it could all be yours! All you have to do is send an email to davecrewe@gmail.com with the subject heading “What We Do in the Shadows Giveaway” and let me know your name and postal address. This giveaway is only open to Australian residents over fifteen years of age, and winners will be announced by the end of this week. Thanks to everyone who entered! This giveaway has now ended; congratulations to Jade, Vicky and Heidi!